When we visited the Sahara Desert in February I knew that my kids technology devices (Kindle, Nintendo DS, and my iPhone) were not going to hold their charge the entire trip. I’m somewhat ashamed to admit my youngest son is addicted to technology. It’s something we’re trying to work on and it’s hard! The kids knew we were going, they knew how much driving was involved , and how long we would be gone. As always, I allow them to pack their own bags. I knew the little one was going to rely on his Kindle and I fretted a little wondering just how bad his meltdown would be when the power went off. I don’t advise this. Even though it really was refreshing to not be on the grid towards the end frustration and boredom began to set in. Instead, prepare yourself and your kids for their technology free reality. I asked some of the experienced family travel blogger community to share their tips and ideas for technology free travel activities and here’s what they had to say. There’s really way more than 16 ideas – something for everyone! These simple ideas from Tamara of We 3 Travel are a great way to get kids to do some educational work on the road! “I put together a travel workbook with various worksheets for school work and destination related info. To provide a little motivation, she earns souvenir money by completing her workbook. We also like to bring along a deck of cards and either Uno or Skip Bo.” Uno holds a special place in my heart. On our Sahara adventure K got in on a game with a Mallorcan family – there were three languages at play and the game was still enjoyed! If you want to create a few activities ahead of time Karen of Desert Chica Ramblings has directions on her site of how to make Velcro Craft Sticks that would keep a toddler happy for hours and a Kids Travel Activity Tray that is perfect for road trips. I’m saving those ideas for our road trip next week! Allison of Tips for Family Trips provides her own list of ten screen-free activity ideas for preschool ages and up. Another simple card game for kids of all ages? Julie of Road Trips for Families suggests Would You Rather. It’s available with a few different themes and while it might not be good for really little kids, most ages can easily play. 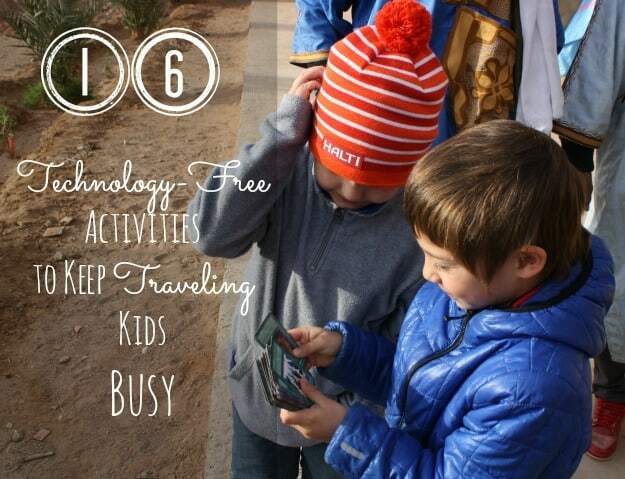 Dana of Find and Go Seek shared this post about their family “mandatory unplug” on one vacation a year. “We bring books (no kindles), small versions of games, a deck of cards and art supplies. We are about to leave for 9 unplugged days on Eleuthera with our now 12 & 15 year olds and I can’t wait!” The older kids get the more important I think it is to unplug – great ideas Dana! Tonya of the Traveling Praters is a travel veteran, having spent many years on the road with her three kids. She shares seven ways to occupy kids on the road– my favorite? Talk to them and sleep! I’m so happy my boys have become very good road sleepers. Need more inspiration? Shannon shares on Traveling Mom some more games and ideas to pass time on (or off) the road. Last, and maybe the most resourceful ideas are from Suitcases and Sippy Cups. What happens when you’re leaving in a matter of hours and it’s time to find things to keep the kids busy? Use what you’ve already got around the house of course! Seriously, give my kids each a mini flashlight and they’ll be content for hours. Your turn! What keeps your kids technology free and busy on the road? Thanks for including Tips for Family Trips in this post! I’ve enjoyed picking up some fresh ideas as well. Pinning for my own future reference. I have a little tin box I bought at a shop called “Fifty Ways To Keep Kids Entertained” – all tech-free. It ranges from riddles to word games to simple toy-less play needing only a patch of grass. Each idea is printed on a little card. I carry the box with me in my handbag at all times! It would be easy to make up your own box – leafing through and picking a card is half the fun for the kids. These are great ideas- and not just for kids! I think I’ll try that animal game next time I’m on a road trip with my friends! Really like how you asked different bloggers to contribute their tips. Looking forward to more articles!